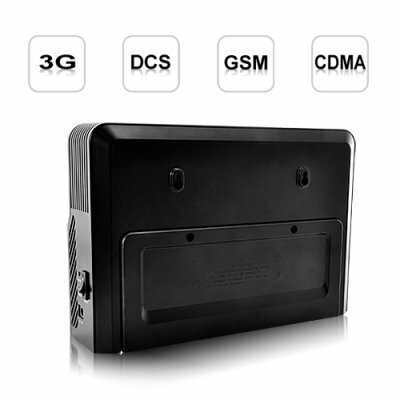 Successfully Added Deception - Hidden Antenna Cellphone Jammer (3G, GSM, CDMA, DCS) to your Shopping Cart. An extremely powerful cellphone jammer that doesn't look like a cellphone jammer, The Deception effectively shuts down both GSM and 3G cellphone signals - it even disrupts older CDMA and DCS mobile phones for silence all around, all the time! The Deception full spectrum cellphone jammer transmits low power radio signals to cut off communications between cell towers and any cell phones in the proximity. Transmission is achieved through the internal hidden power antennas. It does not interfere with anything other than mobile phones within a 40 meter working radius! And the instant you turn this jammer off, all cellphones will automatically re-establish communications and provide full service. While you may have seen plenty of industrial strength phone jammers before, this one is quite simply one of the best we have ever tested in terms of reliability and construction. Brought to you by the China wholesale dropship electronics leaders - Chinavasion. Note: Mobile phone signal jammers may not be permissible to import into certain countries due to licensing of broadcast signals or other restrictions. Please check your country's telecommunications regulations before placing your order..
How could this jammer possibly disrupt 3G cell phone signals when the 3G frequency of 2100 MHz falls outside of The Deception's affected frequency range of 2110-2170MHz range? Though 3G cellphones reportedly operate at 2100 MHz, the number has actually been rounded down for the sake of convenience in the same way PI does not equal exactly 3.14. In reality, 3G cellphones operate within the 2100-2170MHz range and as a result The Deception definitely disrupts 3G mobile phone signals.